Carpetani scouts brought word that the Carthaginians were no longer in their camp and had crossed the Tagus during the night sent the Iberian troops tumbling out of their make shift tents. Stirred to a frenzy all had but one thought on their collective mind - pursuit. The Tagus offered little problem to cross, but a strong current did slow their pace. Those Iberian troops that had reached the far bank called for their comrades to hurry as the Carthaginians could be seen 1,000 paces away. To the Iberian right Numidian light horse and Balearic skirmishers moved forward to confront the Carpetani. The remaining Carthaginian line moved slowly forward, a wall of shields bristling with spear points. Further to the left, Gallic cavalry and skirmishers could been followed by the dreaded elephants. The Carpetani were the first to form a battle line followed by the Olcadians. The columns of Vaccæans on the far left were nearly out of the water when they saw the elephants approaching their troops. Hannibal could be seen behind his spearmen as they were pushing the Vaccæans back toward the river. Vaccæan skirmishers were dealing as best as they could against the elephants, but they too were steadily pushed back toward the river bank. Fatigued by the crossing and a missed meal, the Vaccæan resistance collapsed and they were the first to break with many losing their lives attempting to cross the river. Hannibal calling for his Gallic cavalry and skirmishers to cease their pursuit redirected their presence toward the centre. Here, half of Mago’s command was containing the Olcadians while all his Numidian light horse and skirmishers were holding the Carpetani at bay. In the centre, the Gallic warband supported by loyal Celtiberian troops were gaining the upper hand on the Olcadians. Redoubling their effort, Mago’s spearmen tipped the scale to send the Olcadians fleeing back to the river and thus ending the game. 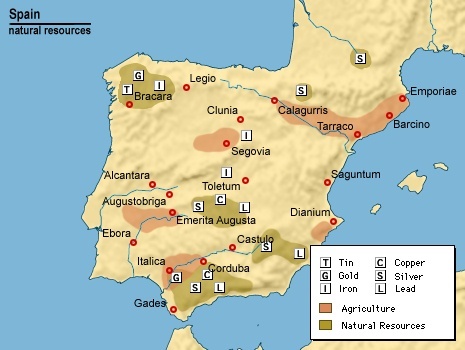 Two Iberian commands were broken bringing the total number of elements lost to more than thirty percent. Surprisingly, Carthage lost none. Suffering from poor pip scores, the Carpetani made little impression in the battle. All three Iberian commands did form battle lines on the south bank, but these lacked an effective coordination which was the effect envisioned. Raising the number of Iberian commands to four would convey an impression of ‘mass’; giving them a two to one advantage of number, but doing so would create considerable congestion on the far bank when trying to deploy (the actual playing area was 1 ½ times the standard board size). Alternatively, one could increase the number of columns for each command from two to three, but then the Carthaginian deployment should be moved closer to the centre line (3BW). This would generate a faster game, however, this particular test needed less than an hour to play. In 221 BC, Hannibal Barca succeeded his father as commander in chief of the army at the young age of 26. Spending the next few campaign seasons consolidating the territory of Hispania he returned home from one expedition laden with spoils and was confronted by a massive coalition of Carpetani, Olcadians and Vaccæans near the River Tagus. One source gives their strength as 100,000, an exaggeration, but whatever size he did not want to meed it in the open plain. Demonstrating tactical skill, Hannibal crossed the Tagus during the night and expecting the Iberians to pursue, Hannibal deployed his troops away from the river bank to allow the enemy sufficient room to cross. The following morning, the Carpetani discovering that the Carthaginians had crossed during the night, moved in pursuit by crossing the river at a number of points. Perfectly timed, the Carthaginians caught the Iberians while crossing and broke their army. Hannibal crossed the Tagus a second time to pursue the remnants forcing their kings into submission. The sole purpose of refighting this battle was to experiment with river crossing and could such a game, despite its outcome, achieve a balance enjoyable for both sides. There are a number of problems that need resolving, such as the size of the Iberian army, the actual crossing of the Tagus, and the relative position of the Carthaginian force. Having completed the Battle of Toletum, I kept the Iberian troops to represent the Carpetani coalition and swapped two Roman commands for Carthaginian ones. If one wishes to increase the number of Iberian commands I have some thoughts in the next post as to how best to adjust the game for play balance. Next problem was how best to represent the crossing of the Tagus river. The accounts of the pursuit describe the depth as chest height for infantry but troops would have to contend with a strong current. Allowing each tribe to form two columns would help speed crossing, but good pip scores would be required to deploy from column to a fighting formation on the left bank. Visualising the crossing by a horde of troops, one could imagine this would nearly have its own momentum – similar to a pursuit move. Therefore, to maintain a good game tempo each column could move 1BW while crossing regardless of the pip score cast. This would help keep a constant flow of movement so Iberian commanders can utilise their pip score on reaching the far bank to scamper into battle formation. From the photo you will see the start positions of the Iberian columns and the Carthaginians deployed for battle. Both armies deploy no closer than 6BW from the centre line, in place of the usual 3BW. The extra distance should allow the Iberians time to position at least half their force on the left bank before the Carthaginians have reached the half way mark; that is the theory. I searched the internet for photos of the Tagus River and the countryside presented nothing new that had already been seen for the previous Battle of Toletum. For this test game, I omitted the BUA and kept one difficult hill with a few scrub or rocky ground and one long waterway. Carthage, as defender would position the three pieces. Tomorrow – fighting the battle. “Caius Flaminius took Ilucia of the Oretanians, while Marcus Fulvius fought a pitched battle and gained victory against the Vaccæans, Vectonians, and Celtiberians near the town of Toletum. After completion of the Consular Army (Polybian), I began a series of historical matches between it and a host of enemies of the post-Punic War period. Although these were the standard 12 element size armies I did make a list of larger battles that I would to do as these presented a number of challenging situations. Toletum was one such battle. Both Livy and Appian cover the War in Spain, but the latter omits any mention of Toletum. Appian does write about other conflicts involving the Celtiberians, so we can draw some useful insight from those brief references. In 193 BC, Marcus Fulvius (Nobilior) served as praetor in Hispania rose to fame as consul four years later. According to Livy, 193 BC is a particular busy season as all four commanders (2 consuls, 2 praetors) were on campaign in various parts of Hispania. In practice, this would give each commander a legion and an equal number of auxiliaries under their command or approximately 10 – 12,000 men. Using the historical ratio in the rule book, we can calculate the number of elements required for the battle. Opposing Rome is a confederation of Vaccæans, Vectonians, and Celtiberians led by King Hilernus. Whether the Vectonians are Hispano-Celtic or Celtiberian is up to debate, but the Vaccæans are related to the Celtiberians. Regarding the strength of their force, Appian does mention the Celtiberians raising 20 – 40,000 warriors for later campaigns. Even with a lower figure of 20,000 the Celtiberians will still outnumbering the Roman column by half. Livy mentions Toletum as being fortified and served as the nominal capital of the Carpetani, therefore a likely objective to be taken by Fulvius for the upcoming campaign. Using a number of online map utilities, we have a general idea of the topography within a day's march of Toletum. Resting on the River Taag (Tagus); the countryside near the city is relatively flat marked undulating hills with a few rising to a significant height not unlike the Arapiles of Salamanca fame (1812); in DBA terms this would be arable terrain. Tomorrow, the re-fight will be posted. Prior to the start of the 2nd Punic War (219 BC), Hannibal fought in the same region against a similar confederation (Vaccaei, Olcades and Carpetani) before marching on Saguntum. So I may be dusting off the elephants and Numidian cavalry following this battle. 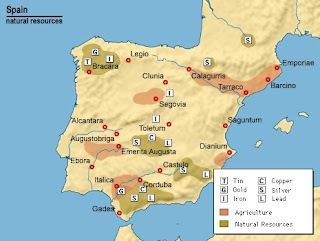 Following their victory over Rome at the Battle of Arausio, the Cimbri and Teutones crossed into Hispania. From Livy, Book LXVII, fragment. "The Cimbrians, having ravaged all the country between the Rhine and the Pyrenees, pass into Spain; where they continue like depredations. The Cimbrians are put to flight by the Celtiberians: and returning into Gaul, they join the Teutons." Re fighting the confrontation between the Celtiberians and the Barbarian coalition is challenging as so much remains unknown. Both combatants have diverse home terrain (hilly and forest) so I opted for a compromise and placed the three matches in arable terrain; this still offers both sides the use of difficult hills and forest. More importantly however, this would give me an opportunity to use my newly constructed Celtic village. The Cimbri had sufficient room to deploy their army between the village and wood. Facing them were the Celtiberians in a line which easily extended beyond Cimbri line. The Celtiberians right flank moved ahead of the main body as they were eager for battle. The supporting caetrati had outstripped them to make first contact. The Celtiberians on the right encountered stiff resistance with one dense column driving the scutarii back. The Celtiberian left were driving their opposition back and rapid slaughter of one warband left a gaping hole in their line. Regaining their composure, the Celtiberians on the right counter attacked the exposed flanks of one dense formation of the Cimbri to quickly roll up the Cimbri left flank which prompted a general retreat. Score 4 -1 for the Celtiberians. This time, the Cimbri deployed closer to their camp leaving the Celtiberians no choice but leave their position near the village. Due to the constricted nature of the terrain, the Celtiberian formed in deeper ranks. The Cimbri shuffled forward giving time for the scutarii and caetrati to deploy into a line. The battle became general up and down the line with neither side giving much ground. During this and the previous bound, there were a high number combats with even scores. Here, the denser formations of warband repelled the looser formation (‘fast’) Celtiberians. Both sides experienced light casualties (1 – 1). The battle now took a fiercer turn as both sides were taking advantage of exposed flanks and isolated units to bring the number of casualties to a critical level (3 – 3). The situation favoured the nimble Celtiberians as they inflicted a few more casualties to save the day. Score 5 – 3 for the Celtiberians. For the final match, the Cimbri rested their flanks on the two dense wood. It was hoped the cover would work to their advantage. The rapid approach of the Celtiberians gave the Cimbri just enough time to set up position in time to see caetrati closing the distance. The edge of the wood on the left were easily held by the Cimbri warband. The wood on the right was in question as scutarii were supporting the caetrati. To counter this, the Cimbri sent a unit of warband to even the battle. The Celtiberian effort in both woods now stalled it was time to move the majority of the army into battle. In the ensuing conflict the Celtiberians lost most of their caetrati, but Cimbri casualties were not far behind (3 – 2). The battle turned as Celtiberians were streaming out of the wood followed by victorious Cimbri warband. This heralded a general retreat and first loss for the Celtiberians. Score 4 – 2 for the Cimbri and Teutones. The Skellige Islands are located off the western shores of Temeria and the Nilfgaard Empire. The six major islands are inhabited by Nordic-like clans each ruled by an elected monarch or Jarl. Seafaring and raiding are their principle pastimes and they were keen to fight on board their long ships or on land as foot soldiers primarily armed with axe and a minority with bow. The islands are mountainous and are not ideal horse-breeding areas and as their number would be limited to agrarian requirements, there are no mounted units. Their army composition would not be dissimilar to Leidang Vikings. Each island is home to a clan and at the Witcher Wikia you can read background information for each clan as well as their colour preferences which make them distinct from other clans. The Skellige Islands becomes the final battleground in the third game, the Witcher - Wild Hunt. The seafaring clans of Skellige raided both sides during the four wars covered by this project; the Southern Conquest and the 1st, 2nd, and 3rd Northern Wars. These raids are mentioned in passing conversations in the books but no detail is given as to which clans were the more enterprising. On a side note, as the empire annexed kingdoms bordering the coast, raiders confronted with frequency the fleets of Nilfgaard protecting their supply and troop convoys. Plans are under way to adapt the DBA naval variant, De Bellis Navalibus, for use with this project. This may take some time as ships and suitable terrain must be scratch-built. The Cimbri and Teutones crossed the Alps to invade the Roman Province of Gallia Narbonensis in 109 BC. In 107 BC, their forces defeated a Roman army and later that year a second army sent against them at the Battle of Burdigala, killing its commander. Two new Roman armies, each led by a consul and totalling 80,000 troops marched to meet the barbarians near the Rhone River. The battle that followed was a disaster (Arausio) for Rome with losses matching the defeat suffered at Cannae, but like Hannibal, instead of pressing on Rome, the Cimbri and Teutones moved elsewhere and crossed into Hispania. The composition of the Roman army followed list number II/33 (Polybian) and the Cimbri coalition (II/47a). In keeping with some semblance of historical accuracy, a Roman army comprised of a citizen legion and an equal number of ‘allied’ troops forming a second legion; these can be seen carrying white shields. The troop types follow the DBA army list to the letter, but are deployed in the game as two separate groups. Terrain, although arable, was kept to a minimum, one BUA and two woods. Rome has deployed its force in two wings, the allied are on the right and the Roman legion on the left nearest the wood. The Cimbri have positioned three dense columns with smaller units of warriors filling in the gaps and deployed thus, their army would match the Roman line in length. As the battle commences, Rome moves forward as one massive group with skirmishers thrown forward on the wings. The Cimbri have moved two of their dense columns toward the Roman legion holding the third back as support. The ensuing clashes Rome drives both dense columns back, but somehow missed the barbarian breakthrough that now endangers their exposed flank. The situation becomes desperate as the supporting Cimbri column charge the allied wing, Cimbri warriors assault the rear of the Roman hastati and the Cimbrian chieftain delivers a personal message to the Roman Consul. The battle was in question as the allied legion had collapsed the Cimbri left, but elsewhere, the Cimbri spurred on by their general brought the decisive blow to the conflict. Score 4 – 3 for the Cimbri. The Roman force caught in the open deployed in their standard formation, but held all the cavalry in a second line as a reserve. The Cimbri, positioned between the village and wood arranged their troops in the same manner as the previous battle. The battle took an encouraging turn as the allied legion repulsed every assault by the Cimbri. On the left, the Roman legion had a harder time dealing with the two columns losing a unit of hastati for their efforts. 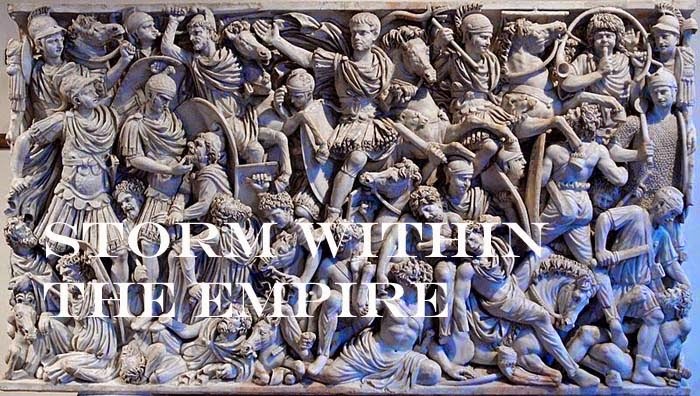 On the Roman right, the allied wing now supported by the cavalry were ready to roll up the Cimbrian left when the horns and drums signaled a general retreat; resulting from the quick collapse of the Roman legion. Score 4 – 0 for the Cimbri. Rome deployed first but kept the citizen legion in the centre with the allied troops split evenly and positioned on both flank. The consul taking a centre position placed the allied cavalry on the left flank. Although inconvenienced by the village and wood, the Cimbri kept to their battle winning deployment but positioned their cavalry on the left flank. Through mixed signals only the Cimbri left started the battle and this was easily countered by the Roman right. Fearing an ambush, the Roman centre moved cautiously forward. The battle quickly escalated with the Roman right heavily engaged with the warband and cavalry. The Roman centre was under pressure by the dense columns sent against them, but they held their ground. The drill and discipline of Rome was beginning to whittle down Cimbrian resistance as they slowly caused more casualties than the Cimbri could inflict. Score 4 – 1 for Rome.